Naturally, you want the granddaughter birthday wishes you send to be the very best. What are the best? 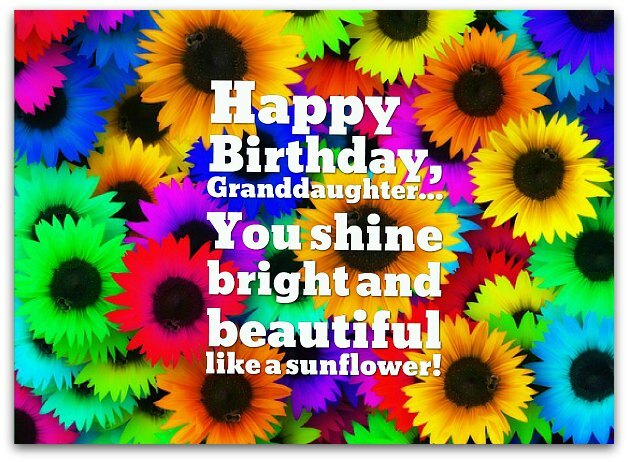 The best birthday messages for granddaughters, like the ones below, have all the elements you need in granddaughter birthday greetings: unconditional love, inspiration and support (plus everything you feel about your granddaughter). Granddaughters are special — that goes without saying, I guess. And I don't think I really need to tell you just how special they are. You know more than I do (I'm not a grandfather) But, as a writer, I do need to remind you that their "specialness" should have an impact on your choice of granddaughter birthday wishes. 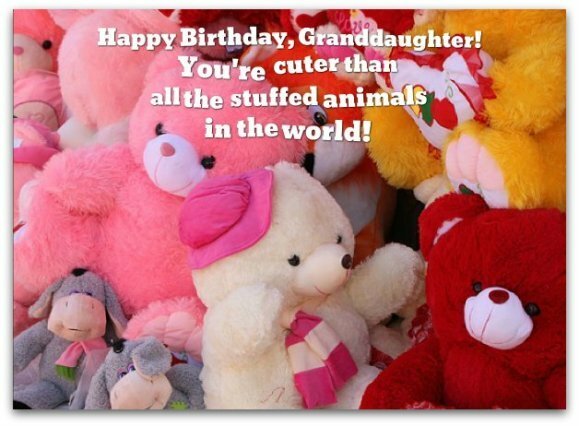 Unfortunately, there's no "one size fits all" kind of birthday wishes for granddaughters. You have to take a closer look at your granddaughter and ask yourself: what type of birthday greeting will truly make her feel special? Sure, you can just pick a standard (read: generic) birthday verse and be done with it. That's the safe, easy way out. But it won't make your granddaughter feel so special. Generally speaking, the young ones care more about the gift you'll give them, so stick to kid-oriented birthday greeting. With the older ones (read: teenaged ones), you have to take that "closer look" I mentioned above. How should you proceed? 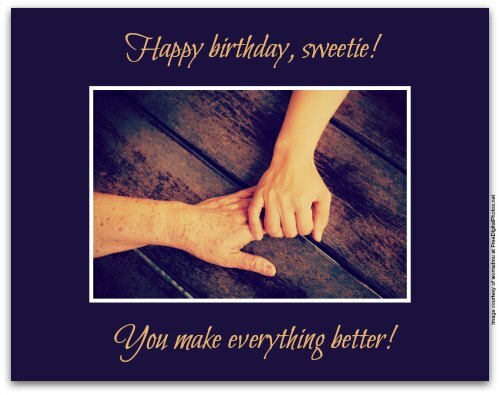 Basically, you need to realize that your granddaughter communicates on a whole different level than you, so knowing how to relate to her may help you choose a birthday message that will do the trick. To help you, I found an article with tips on building a great relationship with your teen granddaughter. The tips may provide you with real insight into her mind. Click here to read it! (just take a quick look and come right back to pick your birthday greeting). Now that you have a better idea of your granddaughter's mindset, consider the following and I bet you'll be able to pick the right granddaughter birthday messages in no time at all. Include what's "hot" and exclude what's "not so hot." Show that you truly listen to her and her needs. Share a common interest you have with her. Accept her apology, if you and her had an argument. Let her know that you've learned important lessons from her. Show that you know her and what she likes. Show her that she's always on your mind. Let the inner grandparent come out if she's the sort who would let you. Let her know that the little things you do with her are special to you. Overall, what’s the best style? Probably a mix of cute and happy...with a touch of the sentimental (and the right amount of pride in everything she does). Simply start with one or more of the birthday greetings below that best captures your feelings...and add your personal touch, if neccessary. You're synonymous with everything that’s sweet, smart and sassy in this world. Happy birthday, sweetie! Thank you for bringing the best kind of joy, wonder and love into my life — the granddaughter kind. You make me feel brand new. Wishing you the very same on your birthday, sweetie...and every day afterwards! You're like sugar. You make everything so delicious. Your birthday reminds me that, if you hadn't come into this world, life would have been flavorless. You make everything so much sweeter. Happy birthday, sweet baby! You are my little princess, my light, my joy. Happy birthday, sweetie! May all your wishes today and tomorrow come true. I can't think of anyone more deserving of this wish from me. Happy birthday, darling girl! You deserve to win the "Best Granddaughter of the Century" Award every year, especially on your birthday! I love you! Happy birthday, my little award winner! Below is one of those granddaughter birthday wishes that can touch any type of granddaughter. It contains everything a birthday message from caring, loving grandparents should say to their granddaughter: "I want you to have a great life," "you deserve a great life" and, most importantly, "you are great" and "I love you." Heck, I think anyone would love this universal birthday greeting. Happy birthday, darling! May every birthday you celebrate take you on another new and fantastic year-long adventure — not just because you deserve it and we love you, but because it will also make every moment of the next 365 days as amazing as you. Just recalling all the amazing times we've spent together brings me such happiness. Thank you for being a wonderful, wonderful granddaughter. Warm wishes for a wonderful birthday, cutie-pie. Never hide your sparkling eyes, bright smile and glowing face from the world. Otherwise nobody will get a chance to see your light shine so brilliantly. Happy birthday to the light of my everyday life. Granddaughters like you are life’s greatest delight, greatest reason to celebrate and greatest love. Happy birthday to the source of my greatest joy! You have the warmest heart of any granddaughter under the sun. You're so loving, so kind, so gentle, so good . That’s why everyone, including us, warms up to you so quickly. Happy birthday, sunshine! I know that I tell you how special you are to us all the time, but it never hurts to say it once, twice or even more. When someone's special to you, you just want to make them feel special whenever, wherever. Happy birthday to the most special girl in the world! Thinking of you with undying love and immense pride on your birthday...and always. Happy birthday, my sweet love! Sweetheart, you always make me smile. Whatever the future holds, I will love you more and more every second of every day. Happy birthday. You're so full of sweetness. You're sweeter than all the birthday cake and ice cream in the world. That's why everyone thinks you're so delicious. It's why I can't go a day without thinking about you at least 100 times. Happy birthday, sweetie! Of course you're smart, kind, talented and lovable. You take after me! Happy birthday, my perfect child!